← Ebooks on Sale, Over 50% Off! 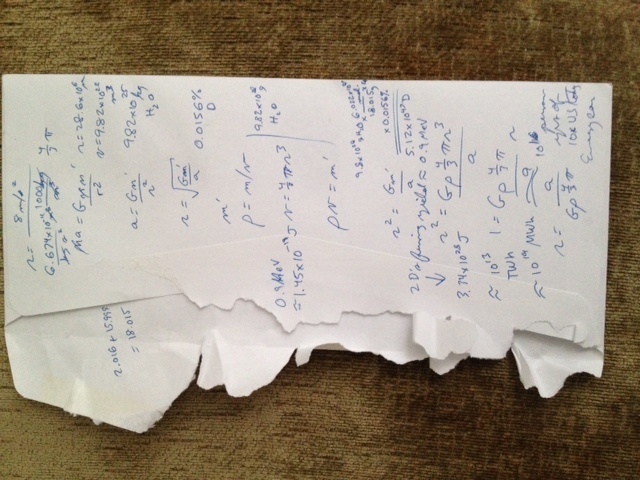 Then I covered the back of an envelope with some calculations of how much water that would take, and looked into the distribution of objects in the Kuiper Belt. Even if all the mass of the Kuiper Belt were water (in reality, it also includes a lot of methane and ammonia), and we converted it all into our synthetic ocean world, it would only provide about 5% of all the water we need. Not to mention that the gravitational potential energy released during the artificial accretion process would heat the planet to about 25,000 K and take tens of millenia to condense. It’s a shame when the universe doesn’t care about our imaginations, isn’t it? Posted on October 28, 2013, in Blog and tagged botec, fusion power, kuiper belt, megaengineering, water world. Bookmark the permalink. Comments Off on The Universe Doesn’t Care.